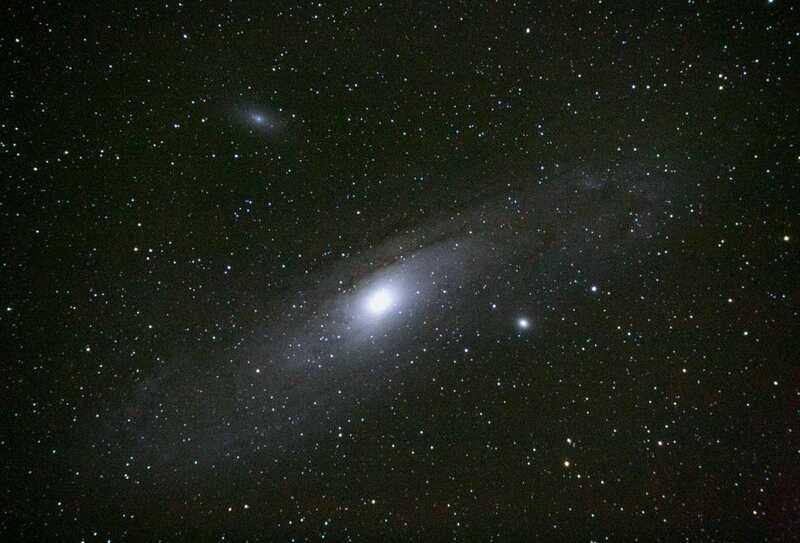 Go into your backyard about 20:30 p.m. EST or thereabouts this weekend and you can see the most incredible thing – the Andromeda Galaxy – one of the farthest objects visible to the naked eye. If you know where to look. Locating the 'other ' major galaxy in our Local Group is an exercise in stargazing on a grand scale, and the beginning of fall is absolutely the best time to take a look at it. You've probably seen the Andromeda Galaxy before in incredible pictures from NASA, but if you've never seen it with your own eyes, now is the time. After all, of the two trillion galaxies estimated to be out there in the Universe, it's the Andromeda Galaxy that is by far the easiest to see, and perhaps one of the most beautiful. What is the Andromeda Galaxy? The nearest major spiral galaxy to our own Milky Way galaxy, the Andromeda Galaxy (also called M31) is 2,538,000 light years from Earth. It's a pretty similar galaxy to our own, and astronomers have long used it as a reference point for studying the Milky Way. Since we are in the Milky Way, it's that much more difficult to study it, so the Andromeda Galaxy provides an easy way of looking at our own galaxy in its entirety. How long would it take to get to the Andromeda Galaxy? Forget it! Although it may be one of the closest galaxies to our own, since the Andromeda Galaxy is 2.5 million light years distant it would take 2.5 million years to get there if (and it's a huge 'if') we could travel at the speed of light. In short, your best chance of seeing the Andromeda Galaxy in close-up is by using a backyard telescope, not a spacecraft. However, you can see also see M31 with both the naked eye and through any pair of cheap binoculars. 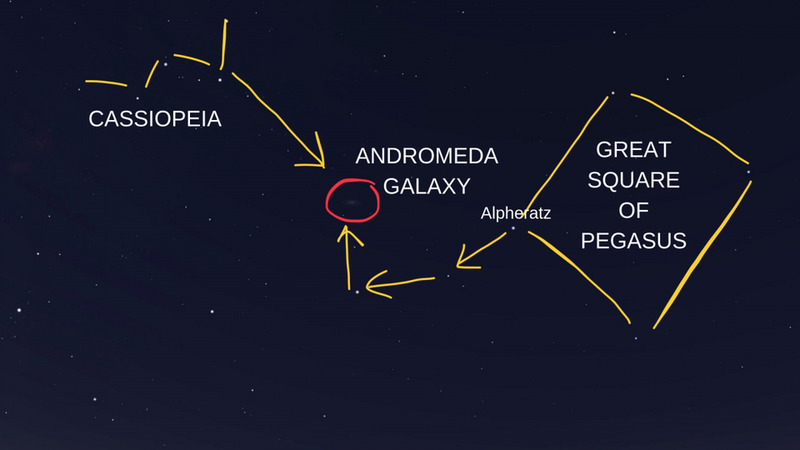 Where is the Andromeda galaxy in the night sky? At this time of year, the Andromeda Galaxy is rising in the eastern sky after dusk, but it takes some practice to find it. So it's important to familiarize yourself with the two constellations either side of it, Pegasus and Cassiopeia. If you look to the east you'll see the Great Square of Pegasus, hanging above the horizon in a diamond shape (you can call it the Great Diamond of Pegasus if you want). Of its four bright stars, identify the one furthest left, called Alperatz (also called Sirrah), which is about 97 light years distant. Now turn to the north-east and find the W-shaped constellation of Cassiopeia, and more specifically, the V-shape on the right-hand side, closest to the Great Square. That V shape points straight towards the Andromeda Galaxy, but to find the exact location it's better to go from Alperatz. If you are under very dark skies you can do this with the naked eye, though most people will be much better off using any pair of binoculars. With Alperatz in the field of view, go two bright stars left and range your binoculars about the same distance up to find a milky patch – that's the Andromeda Galaxy. It's actually in the constellation of Andromeda; although Alperatz is the brightest star in the Great Square of Pegasus, it's also the head of Andromeda. What does the Andromeda Galaxy look like? A fuzzy blob, that’s what. If it disappoints you, you're not looking at it properly. The human eye's peripheral vision is the most sensitive to brightness, whereas it's center is more sensitive to color, so when looking at a galaxy – an object with incredible brightness – look slightly to the left or right and you'll be surprised by how much more of it you see. That applies to both naked eyes observing and when using binoculars, though if you are looking at the Andromeda galaxy through a telescope, look slightly to the left or right of it, depending on which eye you're observing with.